“Set-up” refers to a number of adjustments that affect the playability of an instrument. It also affects the sound, of course. Instruments periodically need to be set up. Think of it like a tune-up on a car. Things go out of whack. On a guitar, frets wear down (or pop up at the ends! ), the instrument shifts around just because the guitar is a thin wooden box being pulled from both ends. On a violin, pegs go out of round and don’t tune easily, bridges warp, and all sorts of other stuff. 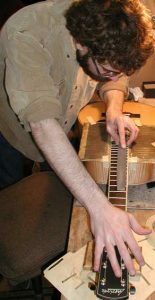 Several years ago we put together a page on Setting Up Guitars, and another page on Setting Up Violins. We lost those pages with the redesign overhaul of our website. We’re pleased to tell you that those pages are back. We hope to demystify the process and importance of a good set-up (including on new instruments! ).